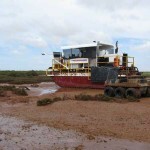 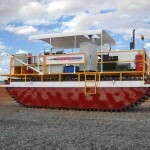 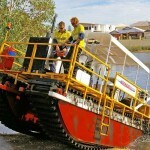 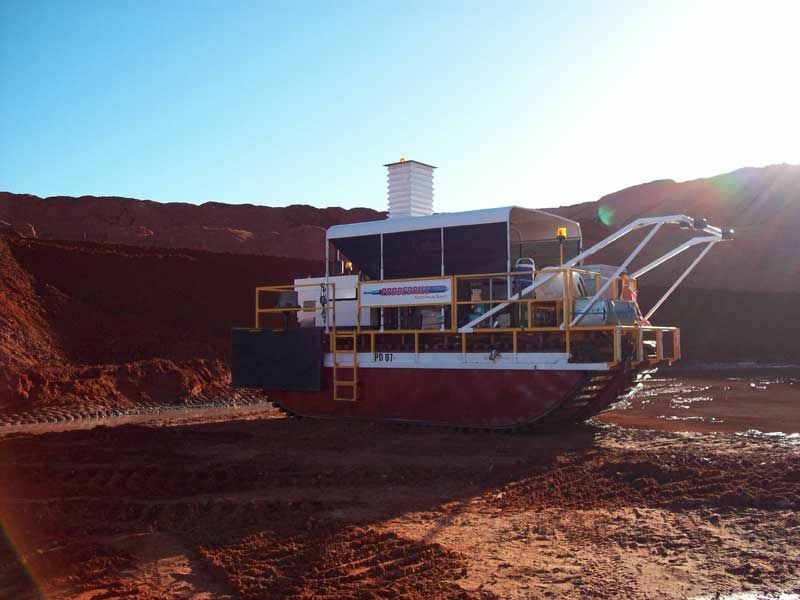 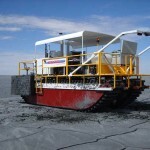 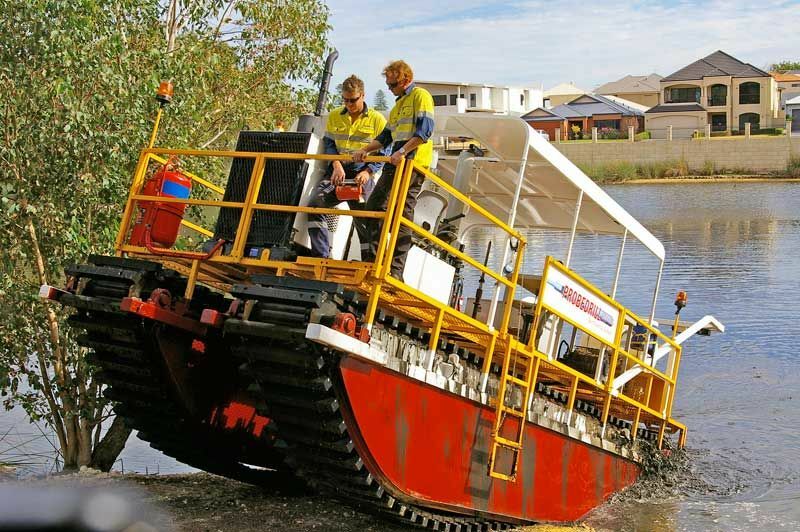 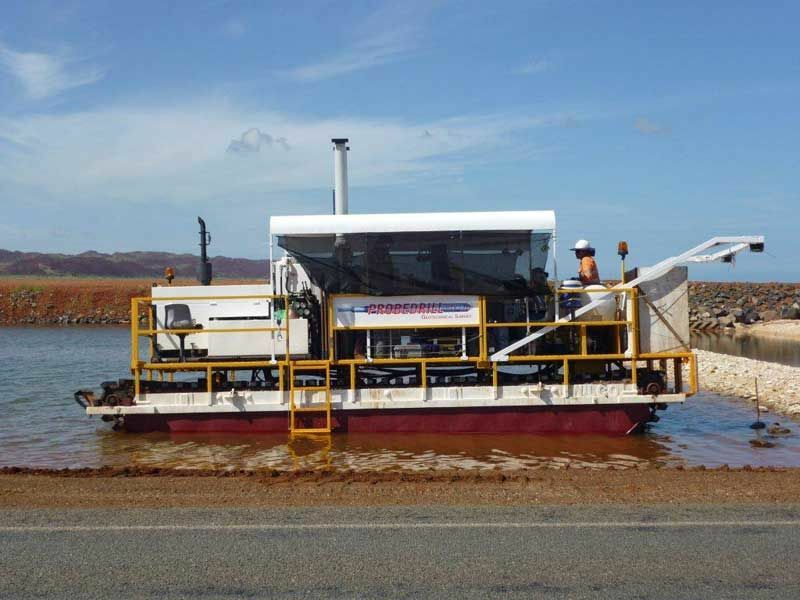 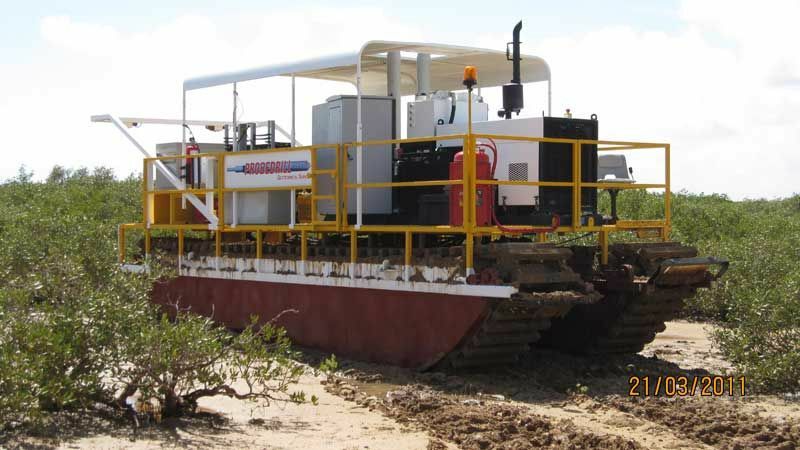 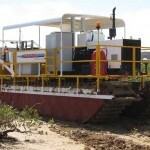 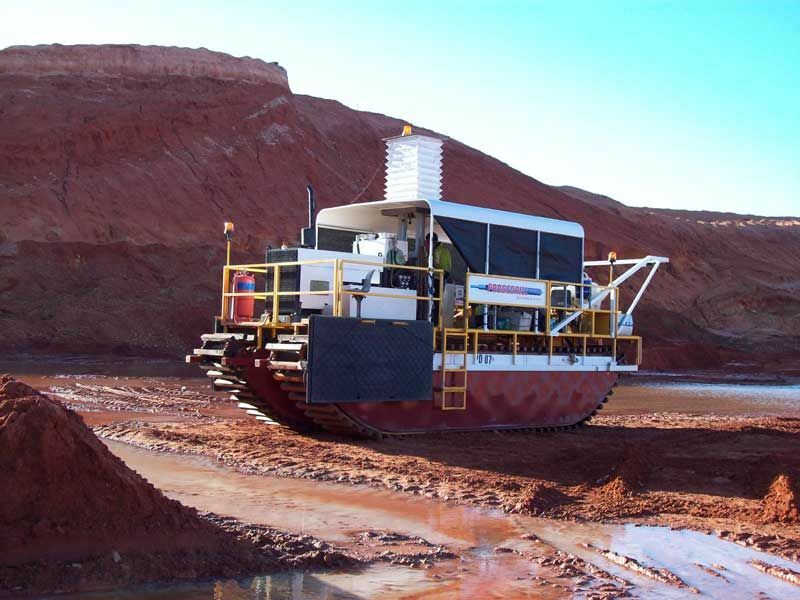 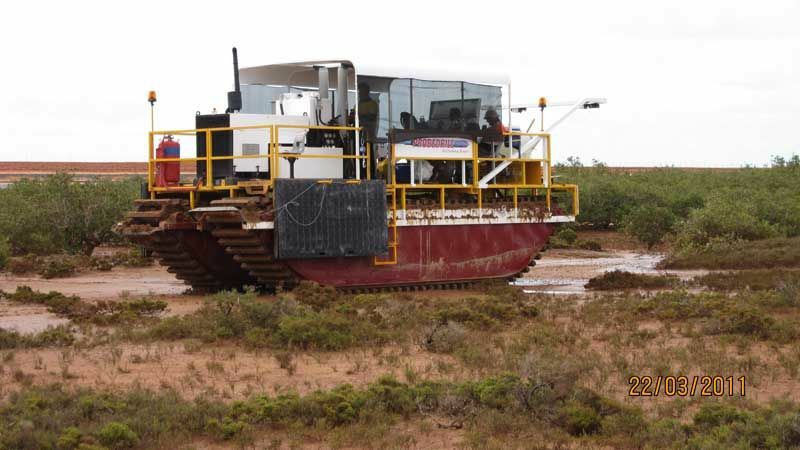 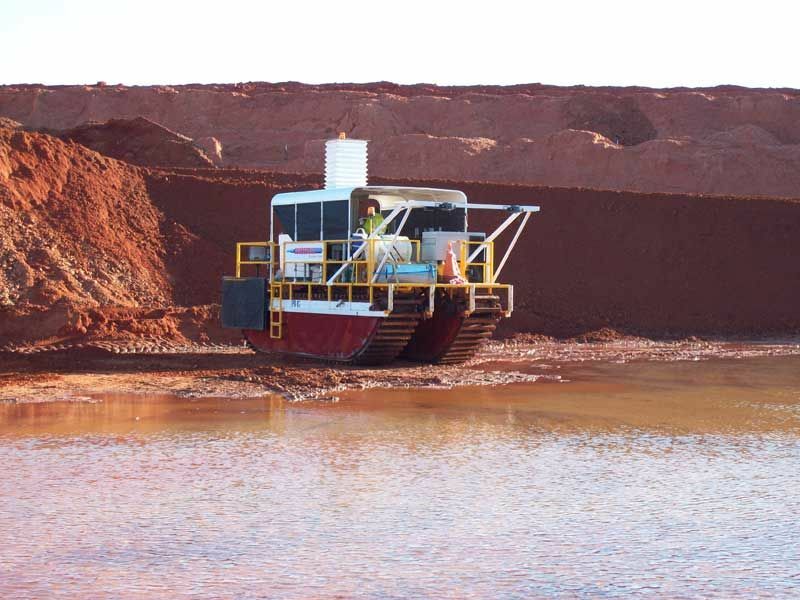 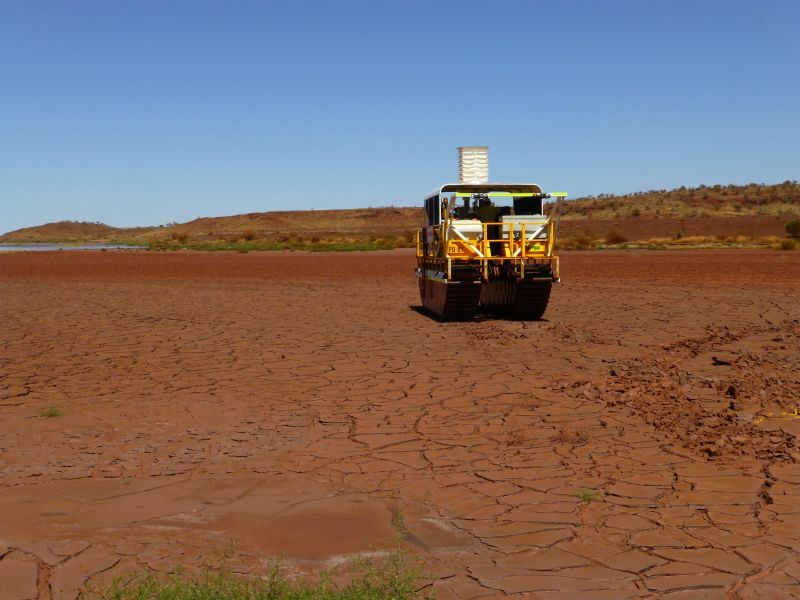 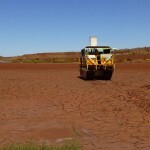 Our 13 tonne Marsh Buggy Rig is an amphibious tracked vehicle perfect for soft terrain locations such as tailings dams, mangrove/swamp and tidal areas. 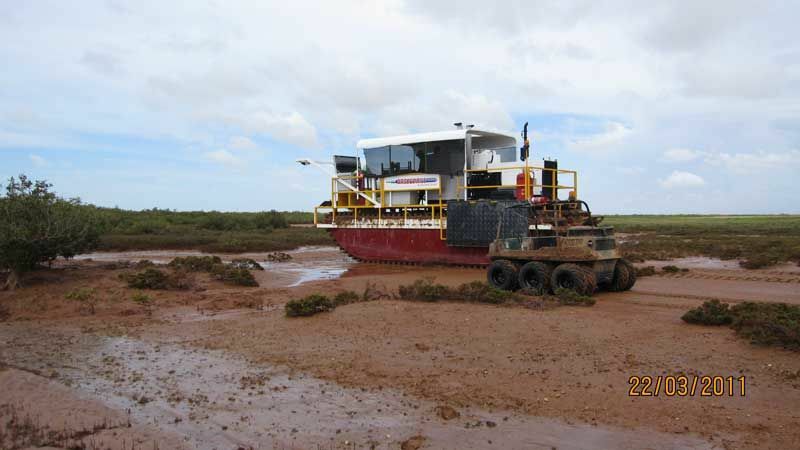 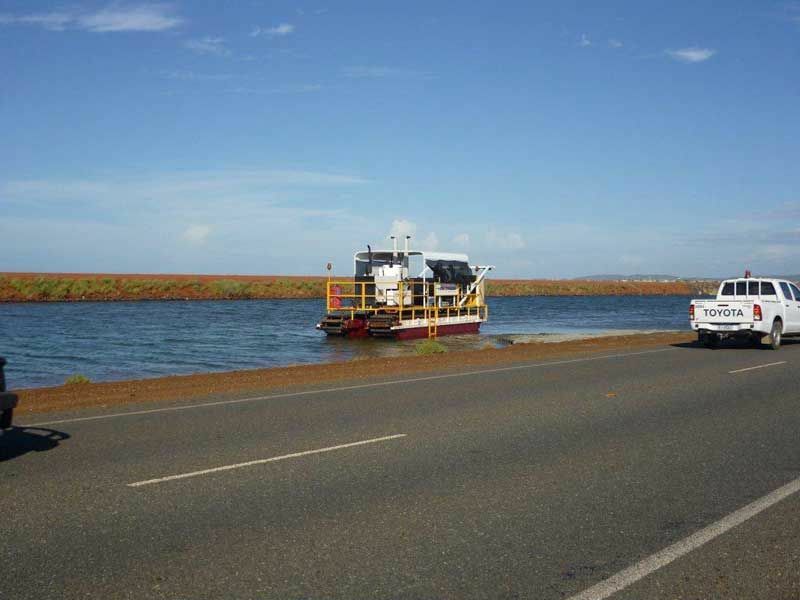 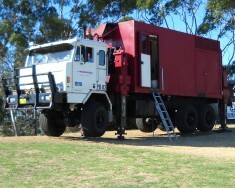 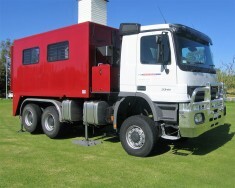 The Marsh buggy is transported to site via a Prime Mover & 14.5m Drop-deck trailer with ramps and comes fully-equipped with a support Max IV amphibious support vehicle which is provided for recovery and rescue. 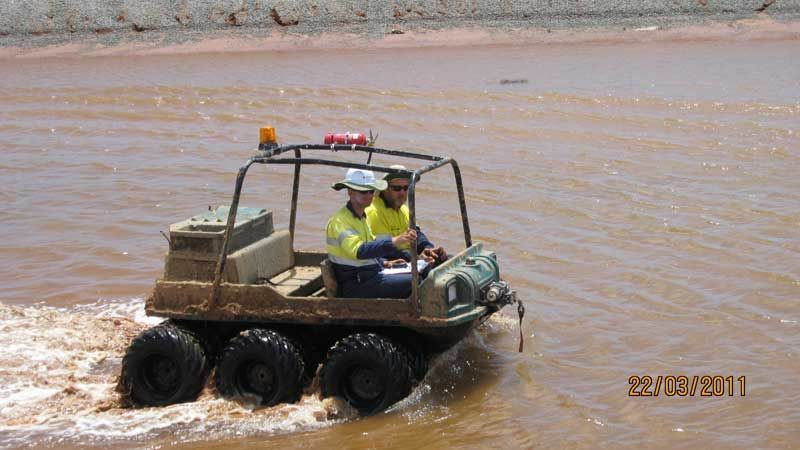 Our Max IV ATV is also available for separate dry hire – click here to download the spec sheet or contact our office for further details. 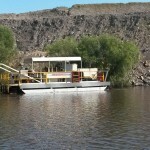 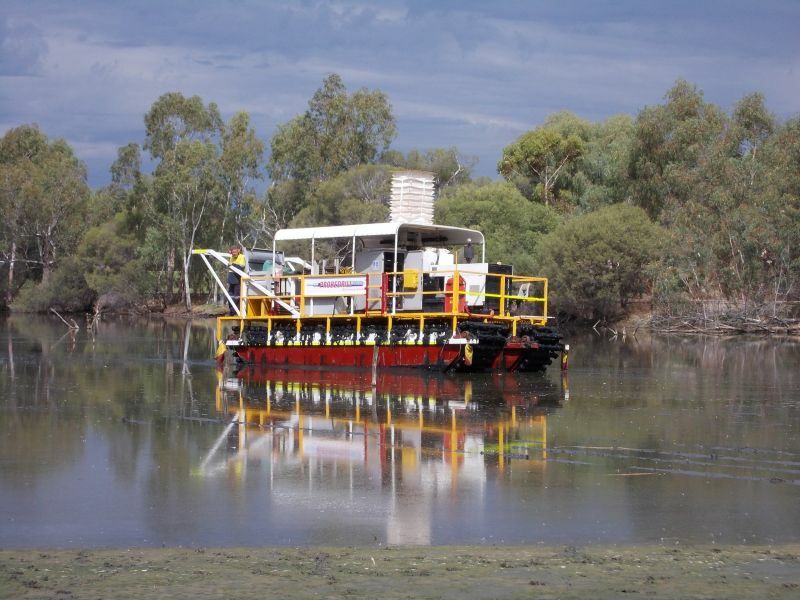 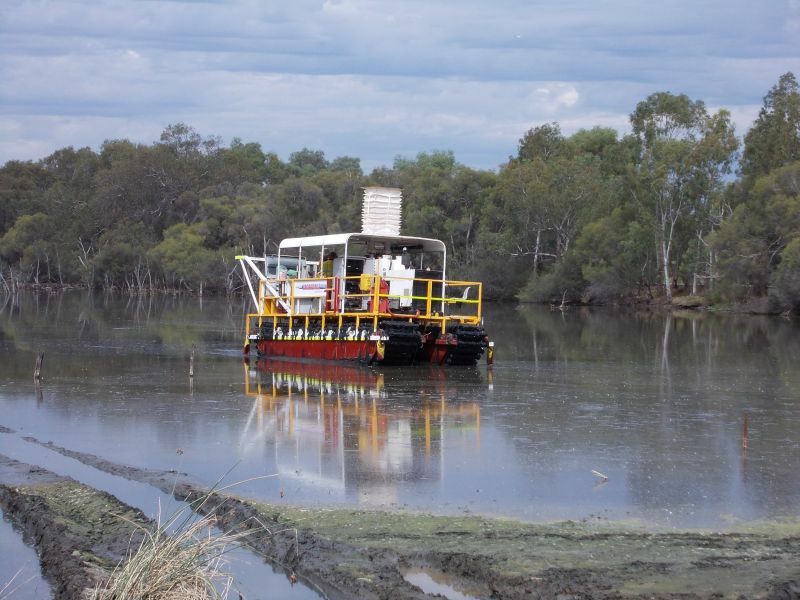 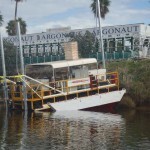 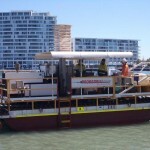 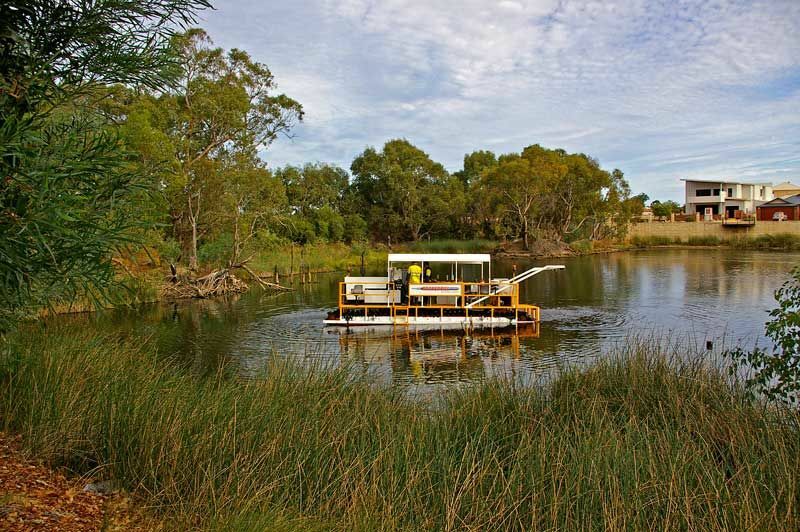 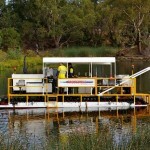 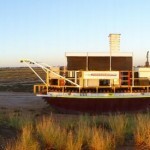 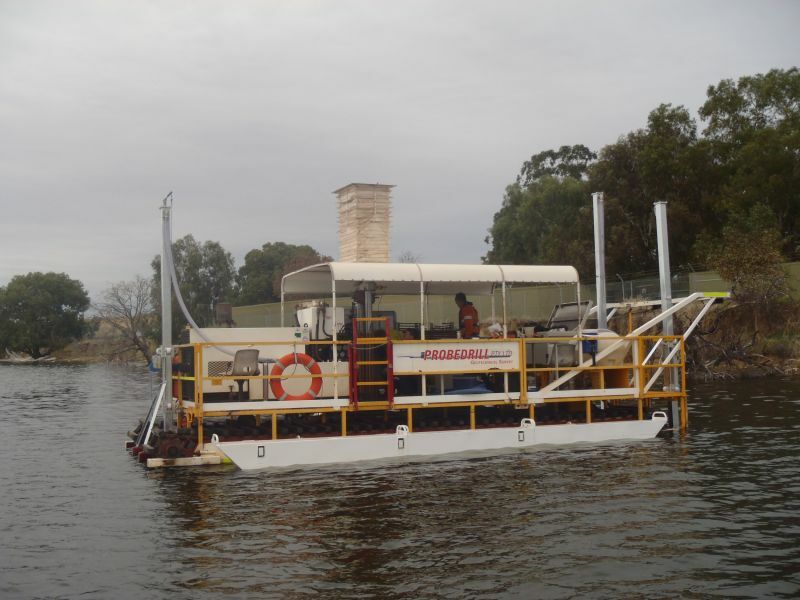 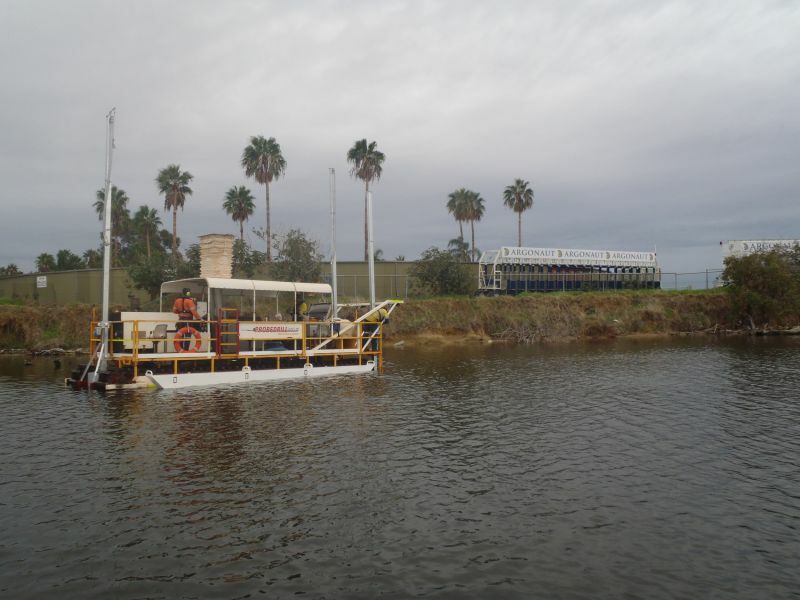 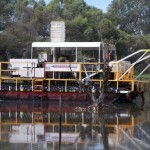 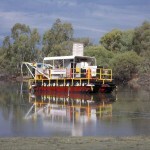 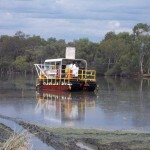 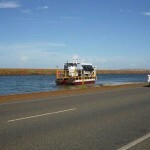 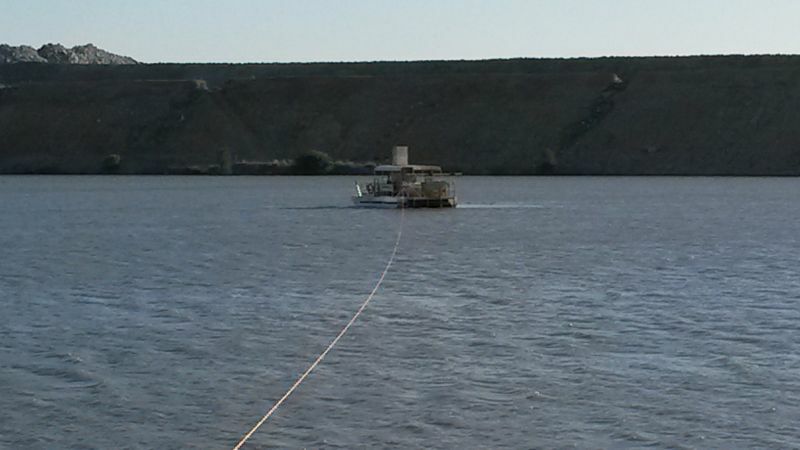 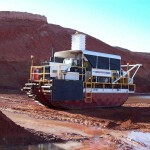 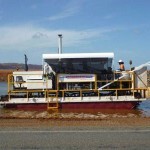 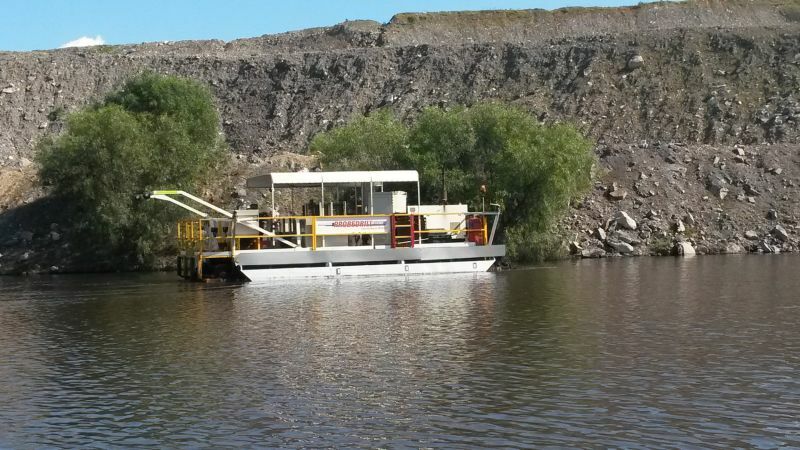 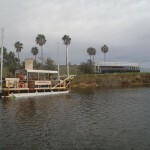 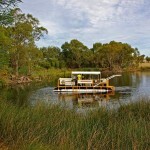 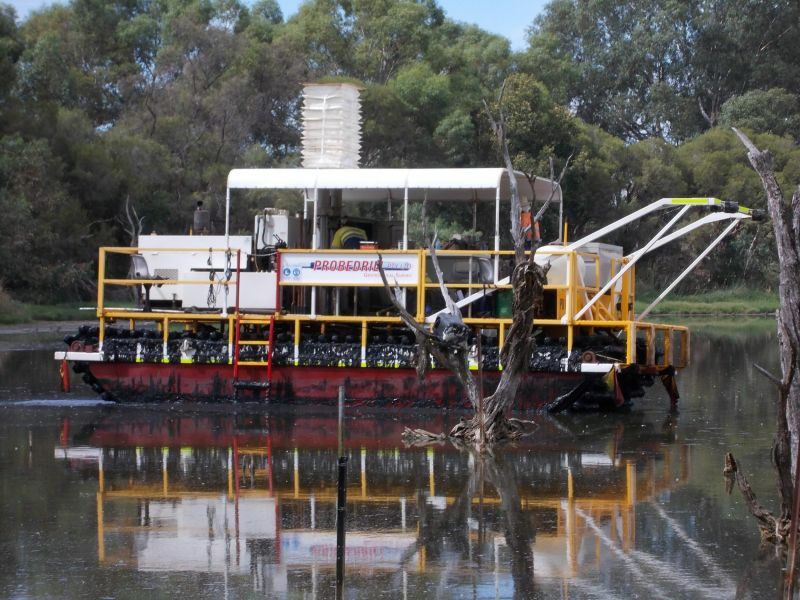 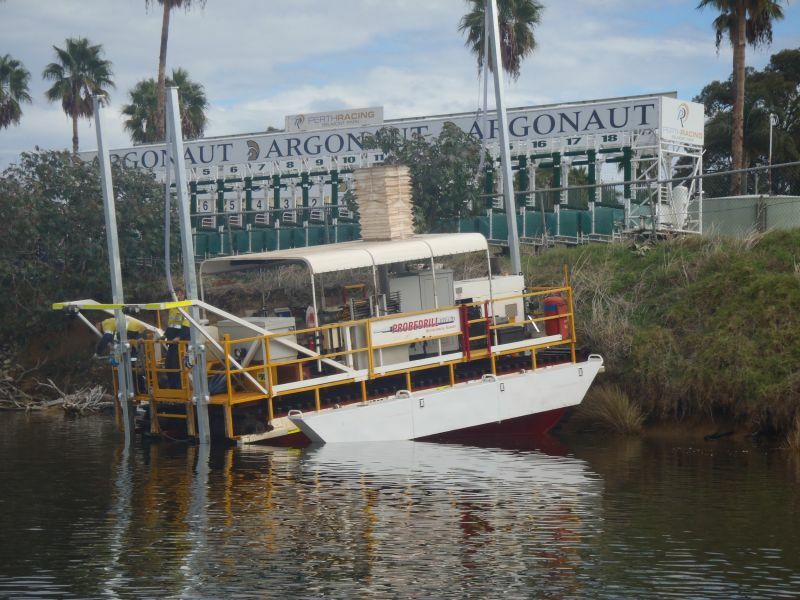 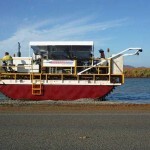 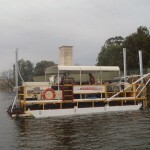 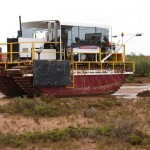 In November 2013, the Marshbuggy rig successfully conducted CPT whilst floating. 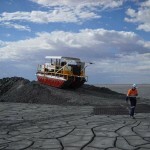 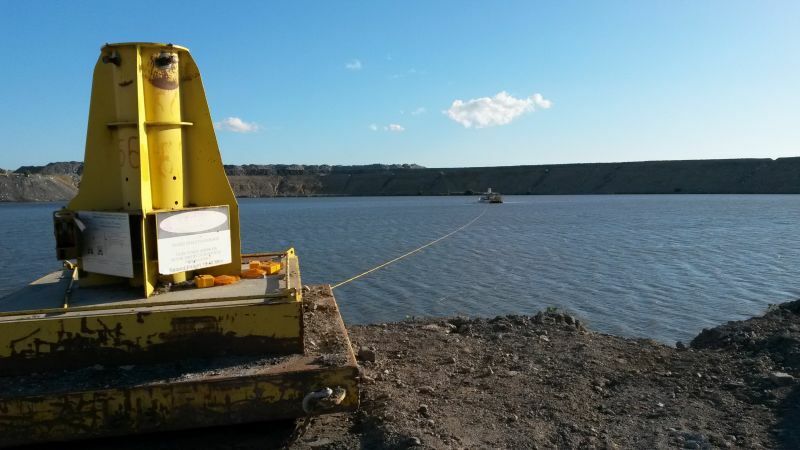 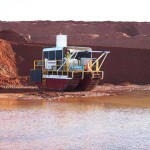 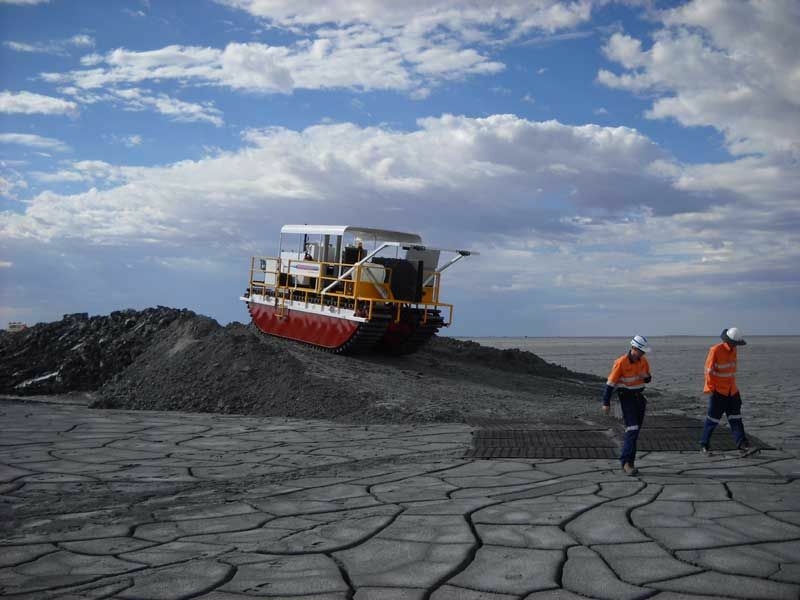 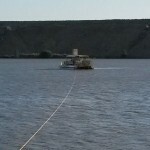 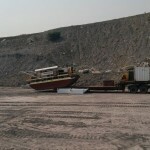 The testing was carried out on a tailings dam, where winch, ropes & shore anchors were used to steady the rig. 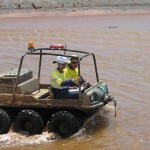 CPTu testing was completed to depths of more than 70m… check out our news update for further details. 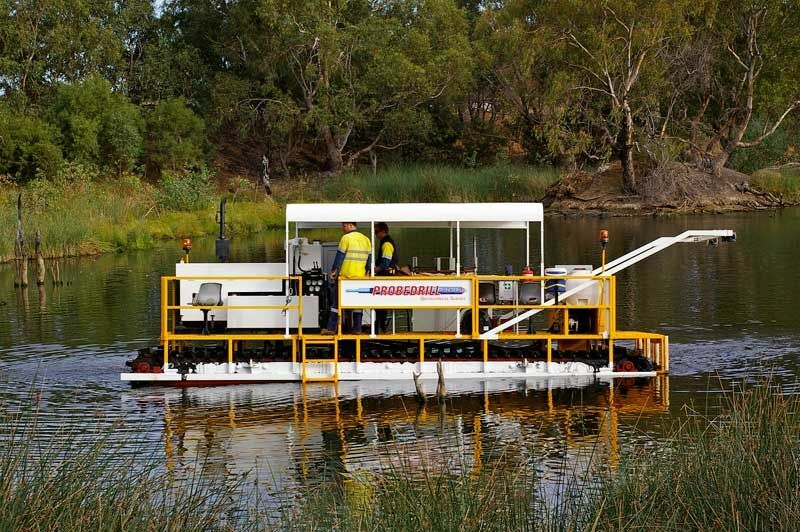 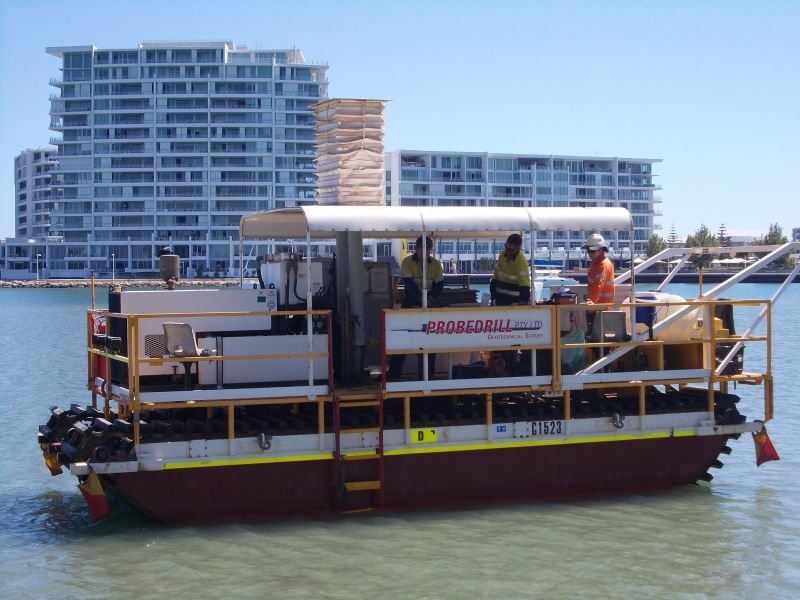 In April 2015, we successfully conducted testing with the Marshbuggy in the Swan River using the spud leg attachments. 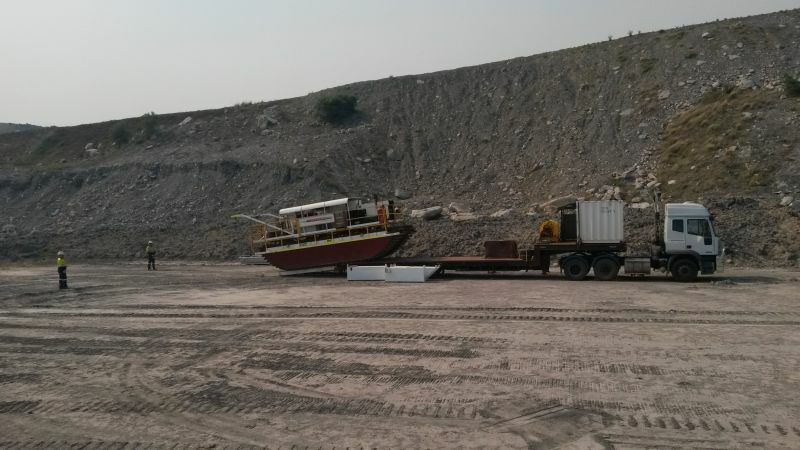 Typically we cannot carry out testing while the rig is floating as the rig needs to be stationary to alleviate any uncontrolled lateral movement of the CPT rods. 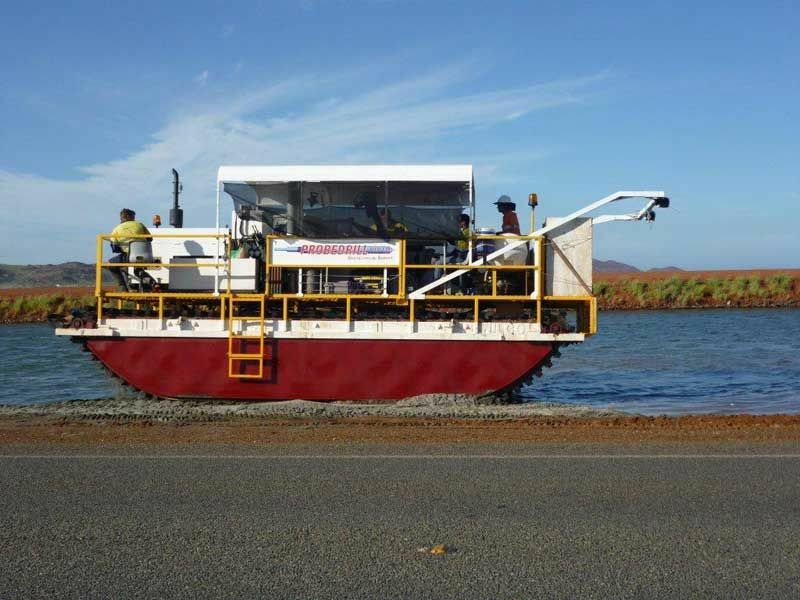 By attaching the spud legs, it provides a quick and effective anchorage system in shallow, protected waters, where rope anchors are not considered suitable. 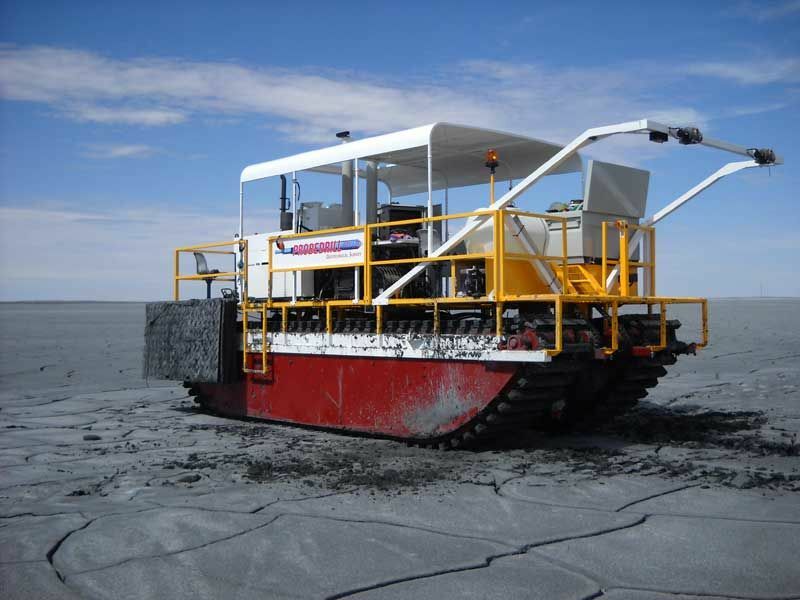 As well, in suitable ground, the addition of a suction caisson to one of the legs will provide additional reaction weight. 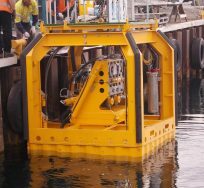 The spud legs will provide stability for water depths of approximately 4.5m. 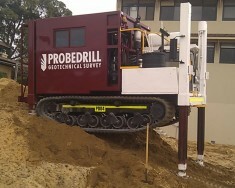 Further developments to the spud legs could see us potentially utilizing them to lift the rig to some extent, which would therefore allow us to increase rig reaction weight and gain pushing capacity. 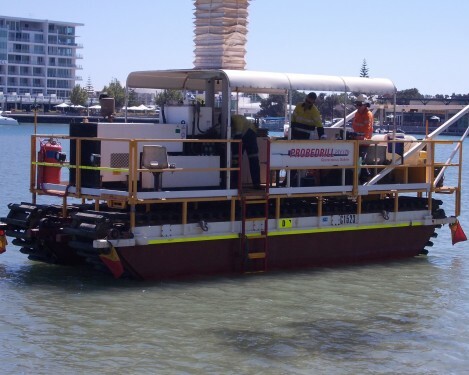 Winch (1) Ramsey Winch: Hydraulically Powered 5.4 tonne line pull with 46m of 9.5mm wire rope. 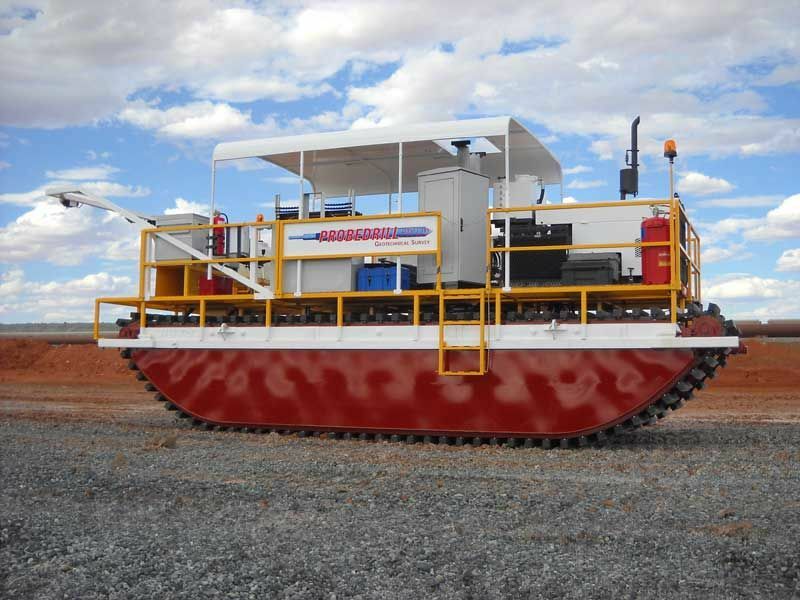 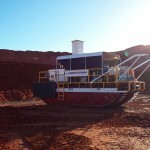 Winch (2) Custom Winch: Hydraulically Powered 2 tonne line pull with 350m of 6mm wire rope. 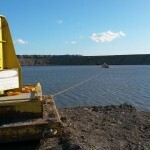 Winch (3) Ancillary (Land based) Haglands Winch: Hydraulically Powered 6.4 tonne line pull with 300m of 19mm wire rope.